Not only does this issue of The Malahat Review contain the two winning poems from the 2007 Long Poem Prize contest, the cover art is contributed by Aurian Haller, one of the winning poets. Haller’s “Song of the Taxidermist”—headed by an epigraph from Wallace Stevens about beauty “in the flesh” being immortal—is made up of nine separately titled sections, each responding to a particular piece of taxidermy. 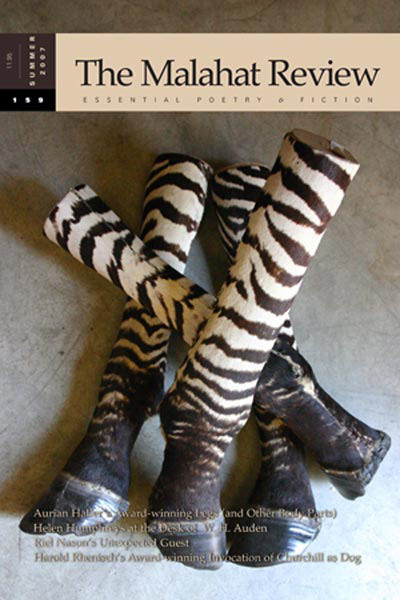 The second section, “Relay, Niemeyer’s Taxidermy, 2005,” concerns a set of four “Zebra Legs in Taxidermy” (from the collection of the poet) which are shown in a photograph on the cover of the issue. Haller’s poem takes the reader on a verbal and visual journey through space and time, examining pieces in his own collection and in various museums and galleries, pieces produced by both taxidermists (Niemeyer) and artists (Picabia, Rauschenberg, Fragonard). Harold Rhenisch shares the Long Poem Prize with Haller for his poem “The Bone Yard.” Though concerned, like Haller’s poem, with animals and animal remains, Rhenisch’s work is a first-person meditation, variously sardonic, comic, and morbid, on the reasons why he named his dog “Winston” (after Winston Churchill). Little more can be said without robbing the poem of its pleasures, but like Haller’s poem it is a compelling reflection on the human as well as the animal. Also of note in this issue are three quite different stories, including Riel Nason’s “The Box,” which briefly recounts the experiences of a “you” who takes an empty box to a wedding as a gift. Stephen Marche’s “Letters to Sunday” consists of four parts (each headed by a date) that read as much like diary entries (about a certain Annabel) as letters.